We welcome you to our web page! Get to know our fabulous staff, learn about our curriculum, hours of operation and so much more. Drop us an e-mail if you would like more information under our "Contact Us" tab! Concordia Lutheran Church's mission is to have an outreach program for the community. The birth of His Kids Child Care and Preschool became reality eleven years ago to fulfill this mission. Over the years, His Kids started small with one building. 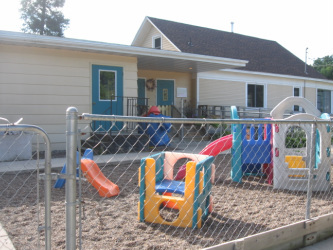 Since then, we have expanded to two buildings, which now includes 5 developmentally divided rooms. We are elated to say that a 6th additional room is in the making: a "NEW "large motor room for all our children to use in helping their development and well-being. We have high quallity programs, which include a focus on the well being of the whole child, including the mind, body, and spirit from infant to school age children. and God's love to guide and share to all our families.